Skinboat Journal: Why Are Sea Otters so Cute? 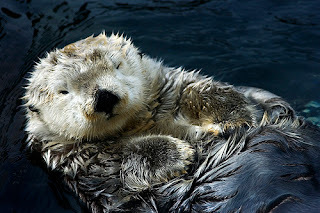 The sea otter post on my blog is the all-time most popular. No other post even comes close. I guess there are a lot of people out there who want to look at pictures of sea otters. Sea otters are probably the cutest animals there are, cuter than pandas even. What makes them so cute? I think that the key to sea otter cuteness is the fact that they look like cuddly baby animals even as full grown adults. I think it's all that fur that makes them look so cuddly. And they lay on their back and they stick their furry paws up in the air and the fur makes their eyes look like little buttons and that black furry nose, so cute. Makes you want to just pick them up and squeeze them.